A charming piece of mountain history that you will not want to miss. This 1925 cabin embodies everything you can think of when picturing a vintage cabin. 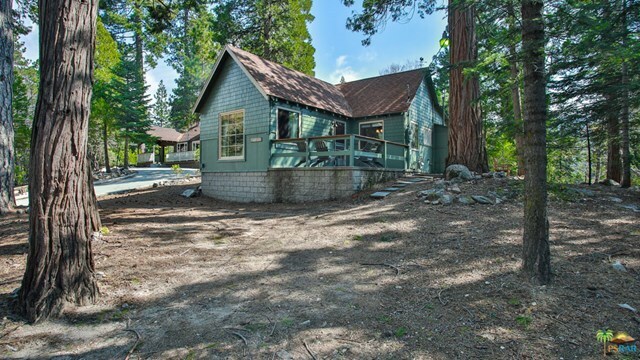 Vaulted beamed ceilings, picture windows, a wood burning fireplace and surrounded by age old pine and cedar trees among the sound of the creek. The dine in kitchen feels spacious and has views of the forested property that the house sits on. A renovated bathroom keeps the vintage charm and provides a fresh feel. Two ample sized bedrooms also have large bright windows. Outside boasts a large deck for dining and entertaining. Behind the house you will find an additional structure that is plumed and electrically wired where you will find laundry features, a work shop and storage. Best of all, enjoy the outdoors on the beautifully timbered property.